In June of 2003 I joined up with BOUNTY at the Eisenhower Locks as she passed through the St. Lawrence Seaway between New York and Canada. The ship looked like a toy in a bathtub when she entered the low side of the lock. Soon, though, the doors closed and the water level rose, bringing the ship up to me. I jumped aboard, feeling like I'd come home after a long trip. 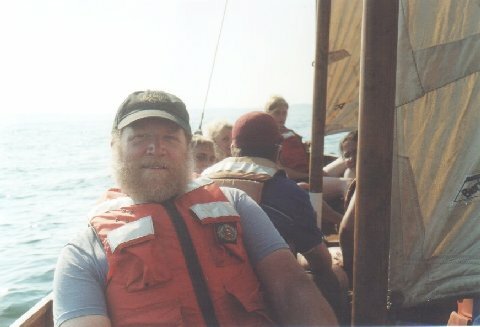 The Captain, my daughter and several other crew members I knew were aboard and we had a few moments to renew our friendships before the upstream doors began to open. A friend took this photo from shore as the ship continued on her way toward Lake Ontario. There was more channel and several more locks in our path before we hit the open lake. After passing through Lake Ontario and the Welland Canal (going around Niagara Falls), we entered Lake Erie. 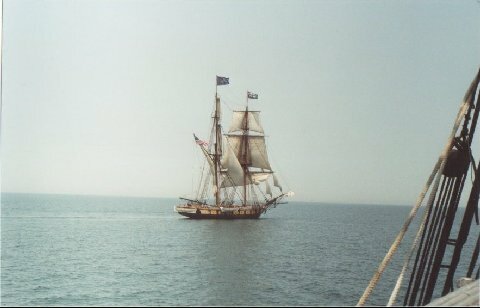 When we neared our next port of call, Erie, PA, Pennsylvania's Flagship, the 1812 Brig Niagara sailed out to meet us. She brought a slew of well-wishers on her decks and navigational charts for the entrance to the harbor. Niagara sailed with us for a while, but soon outdistanced us on the way into port. You can see from her hull and rig that she is a fast ship. While in Erie, Niagara's crew played host for us. 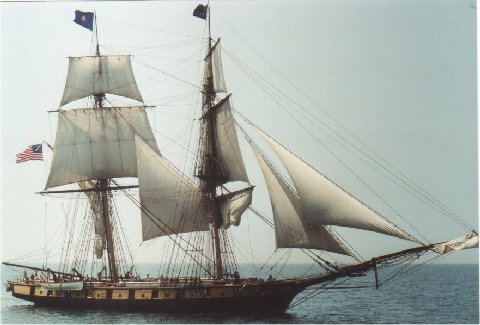 Several of BOUNTY's crew, including myself, went for a sail in one of their cutters. It was a very calm afternoon, but it was amazing to see how fast we could move across the bay.